Diageo, the world’s leading drinks company and parent company of Guinness Nigeria Plc has kicked off its Master Bar Academy programme in Nigeria. The aim of the programme is to teach Nigerian bartenders world class bar-tending techniques they need to build successful careers. The programme also emphasizes viable career opportunities in bar-tending for those who want to pursue it as a career. The programme was the idea of Mark Barrett, Spirit’s Capability Manager for Diageo Africa, who created the academy after visiting bars and clubs in Africa and constantly getting the incorrect serve or poor service. To help address the skill gap, Diageo launched The Master Bar Academy programme in 14 African countries. Since its inception, it has trained over 26,000 bartenders in those countries. The programme is a three month course that is divided into three modules covering core bartending skills such as customer service, the art of bartending, tools of the trade, bartender secrets, drink categories, spirit production, brand knowledge, perfect serves, counterfeit spotting, upselling and responsible serving. The programme underpins Guinness Nigeria’s broader skill acquisition initiative that has helped many Nigerian youths learn valuable skills that have helped them become employable and improved their living standards. Guinness Nigeria currently runs a scholarship programme that supports students in Nigerian universities. The company has awarded scholarships that has enabled many young Nigerians attend technical institutes where they have gained valuable knowledge in engineering and other sciences. The 2015 class was launched with a one day advanced master class programme for graduates of previous programmes to test their cocktail skills. Five highly skilled bartending contestants were chosen from the advanced course to compete in a grand finale, where the best bartender would be chosen. 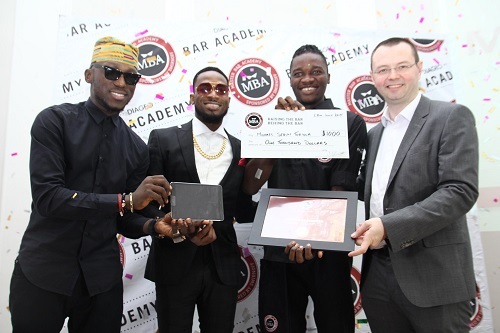 Michael Toriola won the contest with a $1000 prize, an iPad loaded with cocktail apps, as well as MBA cocktail set. “We are proud of the part we are playing to celebrate exceptional bartending skills. We are recognising our winner today, but at the same time, we are helping to build the skills of all participants. In the coming days, we look forward to giving more opportunities to an additional 1, 000 Nigerian bartenders”. Michael Toriola, who emerged the winner of the contest, will be tutored to qualify and represent Nigeria at the World Class Bartending contest, which would be held later this year in South Africa.